Thanksgiving recess will begin officially on November 18th at 10 pm. Have a great break and travel safely!! 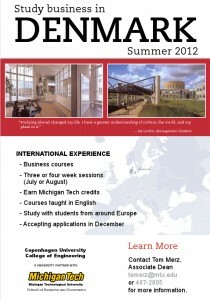 Bemis Company just posted an internship position for the summer, 2012. Below are some details but complete details and to apply can be found in NACElink and the posting ID # is 14299. Due to continued company growth, Bemis Company, Inc. has an opening for an Associate Internal Auditor Intern based at our Neenah, WI corporate headquarters. This position reports directly to the Director of Internal Audit and will provide you with increasing responsibility in the evaluation and review of our financial reporting systems. You will support the audit process through planning work, evaluating the effectiveness of internal controls, testing compliance with Bemis Company policies, executing audit steps in accordance with predetermined audit program scopes, determining activities to analyze, preparing working papers, reporting findings, and making recommendations for corrections or improvements. You will travel to Bemis locations throughout the United States and occasionally internationally to perform financial audits at many of our manufacturing locations. In addition, Bemis Company’s decentralized systems will expose you to a broad base of management styles and accounting issues. Excellent opportunity exists for promotion within the Company from this position. This Internship is available to students currently in their 2nd to last year of school (4th year of a 5 year program, 3rd year of a 4 year program). Candidates are required to have a cumulative GPA of 3.0 or higher and have completed Intermediate Accounting. Andrew Haney will complete his course requirements for a Bachelor degree in Operations and Systems Management in Fall 2011 semester. Andrew will also be earning his commission as an officer in the United States Army. The commissioning ceremony will be held on Dec 10th. Congratulations Andrew. We do not have information on his active duty assignment at this time. Note: Veterans Day is this Friday…. 11/11/11. 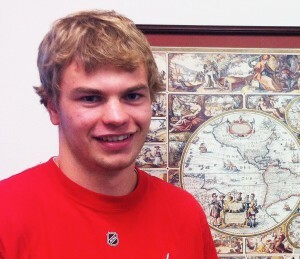 Nathan Sturos will be traveling south to study spanish in Costa Rica. Nathan Sturos and Nicholas Vezzetti continue their preparations for a study abroad experience beginning after the New Year. Nathan will be studying and learning in Costa Rica at the University National. Nathan will be getting immersion training in the Spanish language. I am excited to learn the Spanish language and immerse myself in a culture inherently different than my own. I am looking forward to meeting knew people and getting an education experience that I could not get anywhere in the United States. I think this experience will be extremely beneficial, not only in my pursuit of a career, but also in my life in general. I can’t wait to experience the adventure that this tropical climate has to offer. It should be a nice change from winter storms in the U.P. Nick will attend Shanghai University in China. He will study business and general education courses while living in one of the fastest growing, modern cities in the world. 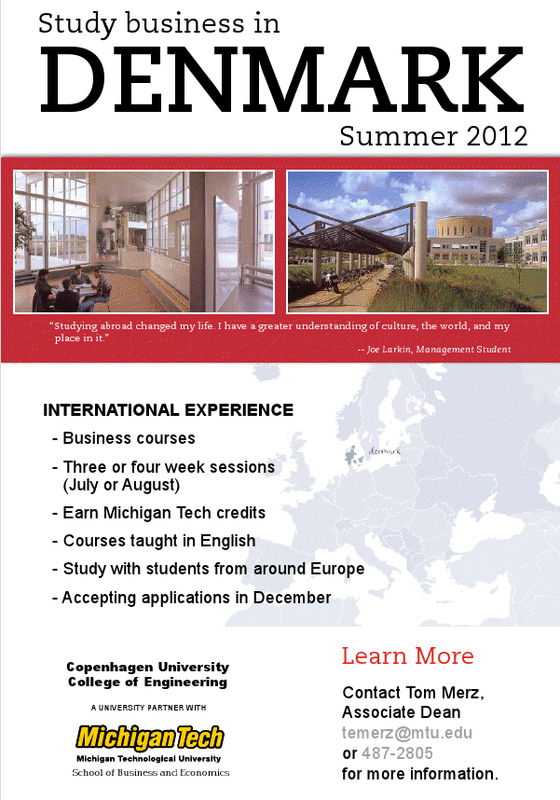 We have a great study abroad opportunity for this summer, 2012, in Copenhagen, Denmark. Courses will be taught in English. A study abroad experience will help you gain a greater understanding of cultures. Applications will be accepted in December. The Spring Career Fair date has been set for Tuesday, February 21, 2012. Want to take advantage of your business and technical skills? Consider joining the Husky Game Development Enterprise. We provide the opportunity to get experience in management or leadership positions, while also getting a look inside the world of video game development. Husky Games (HGD) also gives you the ability to increase your technical savvy by working on a diverse team with computer scientists, graphic designers, and business majors. For more information about HGD please visit http://huskygames.com/ or email info@huskygames.com. Come join us at our weekly meetings every Wednesday at 5pm in Fisher 139. You may apply for graduation up to two (2) semesters prior to your expected graduation term. You must apply to graduate if you want to participate in the commencement ceremony. Thanks. Below is opportunity to apply for internships with various departments of US Department of Transportation. One of the administrations hiring is Federal Railroad Administration. Below is a link to the Summer Intern Program web site. I would highly recommend any student interested in internships to look into the web site and consider submitting an application. Deadline is December 31, 2011.